20 years ago I frowned at anxious brats using mobile phones in the outdoors. But today a smartphone is a handy way to have a camera, an emergency phone, a note book and a GPS all packed into one, especially now that I have found an adequate app for topographic maps, called Map Overlay Tracer. There is a lot of problems with smartphones and topographic maps. Ordinary map services like Google Maps are rubbish the second you leave the roads because they only show the roads, and because they need to be online to load the maps. 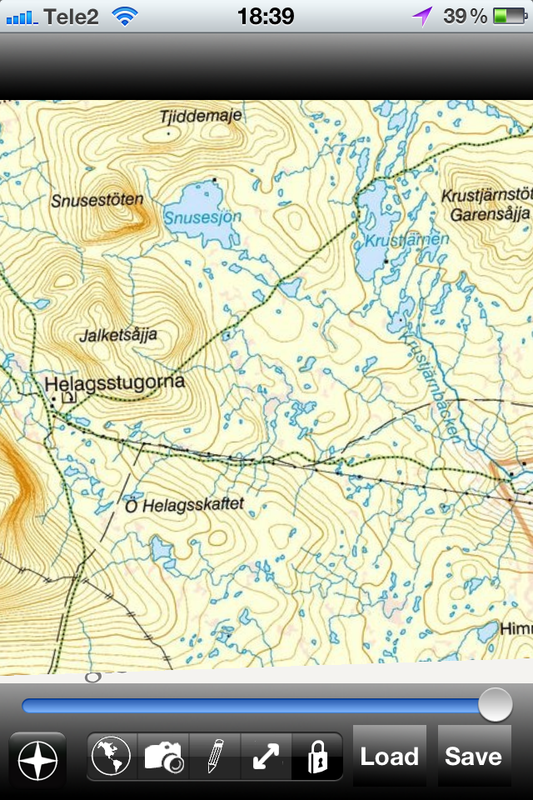 If you hike in Northern Europe there are no free topo maps (as far as I know), and from what I heard the expensive maps you can buy for Europe can only be used with apps that are miles behind "real" GPS software. There are also apps that let you import your own map graphics and then use your five year surveyor education to calibrate them to use with your phone's GPS. So none of those really worked for me. Helags, the way it should look. But after a bit of Googling and trying and throwing coins at the App Store I've found one app that I actually can use! 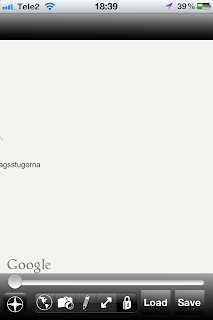 It lets you import any map image and align it with Google maps with a minimum of fidgeting. You can see your position and you can even draw on top your map. And it works offline. It's called Map Overlay Tracer and costs around 2 Euro. Sadly, it's only for IOS at the moment. 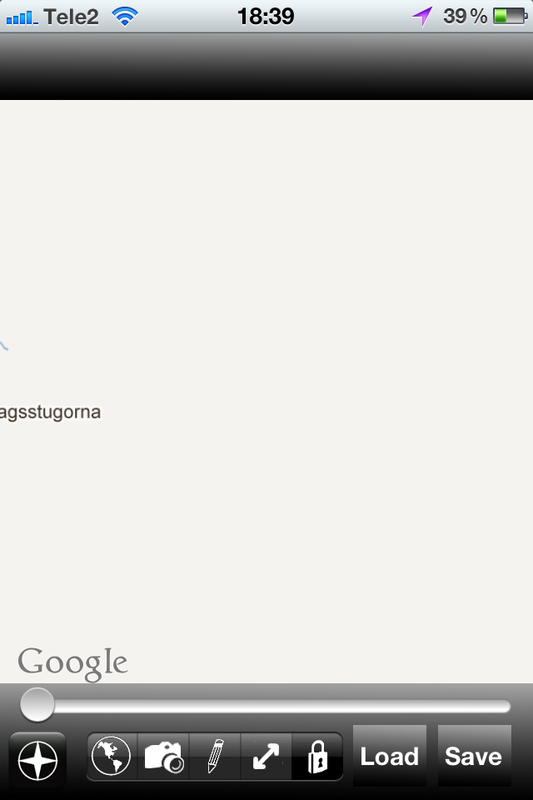 Zoom into the desired area in the background map (it uses Google Maps). Get hold of an image of a topo map (download, screen dump, scan, snap a photo of a map) and load it into the app. Done! When you have saved your calibrated map image you no longer need the Google Maps background, so there is no need to be online any more. Map Overlay Tracer isn't perfect. There is some strange behaviour sometimes and the user interface is a bit unpolished. But the developers listen to the users, and they have kept refining it since 2009. To me it's worth the money. There is of course one big problem with smartphones left to sort out: batteries. Even though most of our trips are not two week treks through Lapland, it would be nice to have batteries that lasted longer than they did 15 years ago. Not shorter. But we will write more about batteries in later articles. What's your top topo map app? Are there gems out there that we don't know about? Is there a similar app for Android or Windows Phone? Please leave a comment! Fugawi is a rather good program according to my opinion. 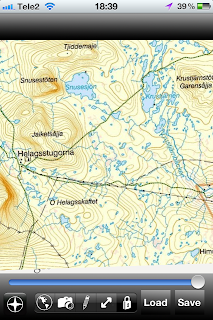 It is expensive but you can download the desired (Swedish) maps when you are at home and then use them on your trip. The problem is that you have to keep the phone-function running or remove the sim card to stop the Iphone from using the batteries to search for a network. The problem seems to be the phone rather than the maps. I think Viewranger is pretty good. I have been reluctant to try Fugawi Imap because so many people say it's bad. With a price tag of 100 Euro (for Sweden) in market were even the best software seldom cost more than bag of crisps, you must deliver perfection. Viewranger seems like a really good alternative! I will try it as soon as possible. I have not been using Fugawi to navigate from point to point with, only to check where I am and how the terrain looks around me. With that kind of use it has always been OK ( providing that I have the maps downloaded in case of loosing contact with the 3G-net). I use oruxmaps with converted Kartex maps and bsb sjökort, it also has a pc companion where you can download online maps for offline usage. If had't already got map images of "my" area I Viewranger would probably be my number one choice. That app definately looks like it's worth trying. You should check out this article out on how to extend the battery life of your iPhone. Inactivating the SIM really extends the battery life. For long distance trekking, it is worth carrying a solar powered phone charger. They are not very powerful but will give you some peace of mind rather than leaving you lost in the wilderness without your G.P.S.! Maybe you should read up on google maps. Nowadays you are able to cache maps so you dont need to be online (I think that was possible by the time you wrote the test as well). But sure... the topo. maps arent that full of information. But I use them pretty heavy when I ski, and used with knowledge about their limitation they do serve a purpose. After nearly a year since my comment I must agree that Fugawi is not worth the money. Their tracking is not working and they will not correct in the near future. Pathaway seems better but it takes time to get used to the human interface. Also I would like to have it on my PC but that will not happen the nearest future, Would´nt it be nice to do all your planning on the big screen PC and then easily download both the maps and the routes to your Android or Iphone?